Sahyadri, a name with which the western ghats of Maharashtra is always referred, has been in frequent discussion for its antiquity and biodiversity. Also people get attracted to Great king Shivaji’s unvanquished hill forts, mountains,valleys, waterfalls, ancient as well as modern day passes. Sahyadri has been a topic of contemporary folk art, literature and saint constructs . Tukaram, a saint poet of Maharashtra, sang songs of harmony with Nature. There are many other aspects of Sahyadri which make us go in the wilderness and get lost and ultimately get inspired. The valour of Sahyadri has been standing still in the form of unbeatable forts of King Shivaji. We in our school days were taught a story of a brave mother, named Hirkani, who was trapped on a fort as the gates of the fort were closed and she had her little baby at home at the foothill of the fort. Due to the discipline of Swarajya, the gate would only be opened upon sunrise next day. She had no option but to reach home and breast feed her baby at any cost. After trying every possible option she decided to descend down a ridge which was never traced or walked by any human being. Everybody on the fort tried to stop her from doing so, but she was determined and a worried mother, took steps down the cliff. She got scratches on her knees and elbows and midnight she reached home for the baby. Shivaji Maharaj, upon learning about the incident called upon the lady and honoured her for her dedication and bravery. Also the ridge from where she climbed down, was named after her very own name, The Hirkani Buruj. This is just one known story of Sahyadri and the bravery of its people. There could be thousands of such incidents which, the history might have forgotten to take note of. Each fort, its main bazzar, people lived in smaller villages around forts, the territorial army, the mercenaries, on the fort like this there might be many accounts that we yet don’t know. However,when we look at these forts, we see The brave side of Sahyadri. Hemant Vavale…At one of his explorations of Sahyadri at Gopya ghat of Velhe. Sahyadri sometimes seems like a yogi, who is gripped for lacks of years in spite of years of rains, storms and harsh sunlight. The yogi is unaffected, unwavering, unbothered and completely obsessed with his own Sadhana. May be that’s the reason Sahyadri was once an abode to such yogis, sadhus and Tapasvis. Many caves like Lenyadri, Buddhist caves and sculptures, many antique Shiv temples can be found in lap of Sahyadri. Sahyadri is unified by the biodiversity, it has been nurturing for millions of years. One must see the blood-curdling besalt cliffs of Sahydri to experience fear. It gives birth to hundreds of rivers and thus gives life to not only the flora and fauna but also the human habitats along the rivers. There are many hydro electrical power plants on the dams constructed on these rivers which supplies power to majors like Mumbai, Pune, Bengaluru and thousands of small towns and lacks of villages. The only source of drinking water of all these cities is Sahyadri. Thus through the ultra-fine network of rivers Sahyadri plays a motherly role also by feeding us with water. Now comes the paternal role of Sahydri, towards the flora and fauna of the region. From some endemic species to varied millions of species of creatures, plants and trees, Sahyadri is like a father figure to all of them. They prosper, flourish, multiply in valleys and ridges across Sahyadri. During my wandering in Sahyadri, I saw hills, valleys, plants, creepers, creatures and people also. I saw people with with rich ethics , values and culture. The glimpse of rich cultural heritage which rooted in the far remote villages in Sahyadri made me think that Sahyadri itself is a culture. The culture, the civilisation which believed in synergy. Interdependence not only among human race but also with the nature around. There are many rituals performed in the course of life of an individual. These rituals differ almost every 12 miles in the area. However the change is minute. The overall principle of agreeing to the greater cause is accepted throughout. Western Ghats in Maharashtra wiz. Sahyadri is broadly divided in 12 regions, which are referred as 12 Mawals(मावळ) .Mawal in layman’s language is the region or direction in which the Sun sets. Setting of the sun towards west is called सुर्य मावळणे. Means these 12 regions of the west side of Maharashtra has 12 variants of the same cultural heritage. And this civilization has its roots in the greater ancient Hindu civilization. There three core terms which shows virtue of an individual or a society as whole. First one is Perversity (Indian synonym is विकृती ) . Second is Spontaneity (Indian synonym is प्रकृती ) . And third one is interdependabilty (Indian synonym is संस्कृती ) . Stephen Covey in his best seller work Seven habits of highly effective people talks of the later one, that is symbiosis or cohabitation or living and leading a happy life together. However Covey focuses on wellness of human race where as our accentuates on harmony in all living beings. Let me quote a few incidents which showcase the preeminence of the civilization we have inherited form our ancestors. It was the later summer days, and I was up on a mango tree in my backyard. We had to pluck all the mango and keep them to ripen. I was about to finish plucking all the half ripen mangoes and there was only one branch left with approximately hundreds of mangoes. My mother asked me to not pluck the remaining fruits and leave those as it is. I got down and made ripening arrangement of the mangoes and then asked the reason of not grabbing all the mangoes to my mother. She easily said that its not only we who should eat all the fruits. We should leave behind some for birds or animals for the matter. What a great breathing example of bringing values to life. This is synergy. Grabbing all the fruits is Perversity. Eating only to fulfill the hunger is Spontaneity and leaving fruits for co-habitats and regeneration is Synergy. She must have learnt the principle may be from my grandparents, and they from their forefathers and this link goes back to time infinite. How civilized a particular society is, depends upon what values, what rituals, what art and what literature, what passion they follow. Do they teach interdependabilty to the generations to come? Do they learn, revere music, art, craft? These people from the 12 Mawal regions refer the earth as The mother earth. There is a reason to it. And there are reason to almost all the rituals we have been following. Shri Gulab Sapkal, my English subject teacher, in my 10th, handed over to me a book, authored by Prof. Kanchan Ganga Gandhe. 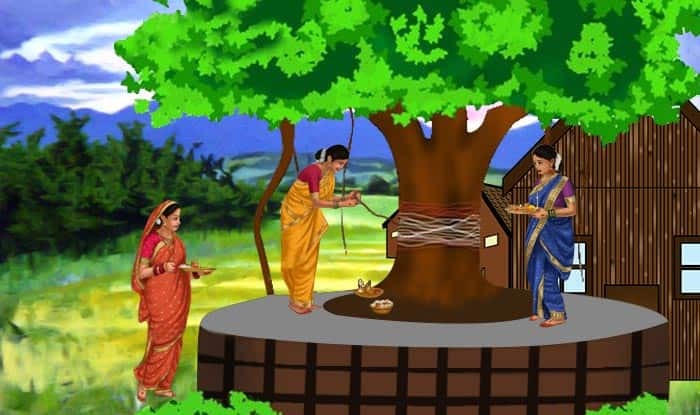 The booked is named as Our Trees and Our Culture (आपले वृक्ष आणि आपली संस्कृती). In this book of maybe not more than 200 pages, she elaborated how trees are linked with different Indian festivals. With scientific and medicinal citations she logically re-established the connect between science and culture. It was only the British, who have spoiled the barter system in India and introduced another concept of castes. And this in turn gave birth to caste-ism. In simple language, caste-ism is distorted form of the noble barter system that prevailed in India. But what this barter system actually was? In my another travel in Sahyadri, I happened to meet a person, in his late 50s. He was waiting at a bus stop waiting for any vehicle which could take him to road head so that he could go to his home in the city. I politely asked him if he needed lift. He nodded in agreement and I opened the door of car. He sat and we started. I normally gel quickly with anybody and people feel free talking to me. In the course of discussion with him I came to know many things about him. He hails from the same village where I took him in car. Now a days he lives in Pune and comes to the village every weekend. He is a barber by profession and by birth. He and his forefathers have been doing this service of cutting hair and shaving, for may be hundreds of years. In return the village has been taking care of the other needs of the family. This man had come to the village the day before just collect his part of the farm produce. He collected almost 28 bags of dhan and almost same of Jawar in the two days. People in the village happily offered him the produce from their farms. Barter system was the exact manifestation of the interdependence, which Stephen Covey talks about. However our culture believes in synergy of not only people but also the nature around. Similar was the scenario with other community servicemen. There were 12 such community services and specific people served the entire society and in return the villagers shared their farm produce with them. Such examples still persists in the Sahyadri, and this makes Sahyadri, the originator of a boundless, interdependent civilization. I happened to be in Hirdas Mawal region of Sahyadri, few years ago. To my surprise I came across a very rare sight , which made me think that our ancestors were certainly not barbaric nomads. They were elite people with great interest in art, craft and literature. I saw a shepherd in the mountains. He was equipped with a flute. He had approximately 40 cows around him and those were grazing. 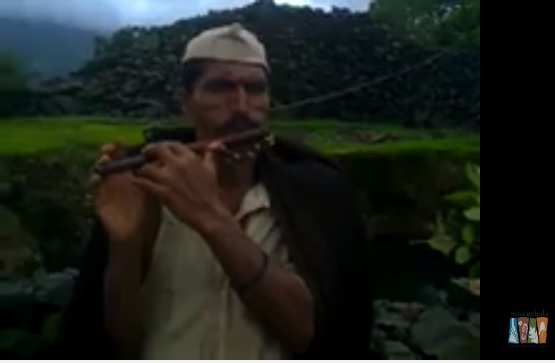 With the unique Ghonghadi on his shoulder and the flute he was playing , he resembled the great Indian Shepherd Lord Gopalkrishna. Later, he told me that there used to be many like him and recently he is the only person who is still practicing the old traditions. All the villages had such Gopals(=Shepherds) and they used take their cattle into the wilderness for feeding. Who taught these people such an art? Isn’t it an example instituting of harmony between himself and his cows and broadly the harmony between himself and the mother nature? What a nice piece of information and drafted so well…hats off to the author. Nicely put together ! Awesome ! Grabbing all the fruits is Perversity….so true…beautiful article .There is an unknown fascination in Sahayadri which attracts me towards it.Would happily join your volunteer gang.thanks Hemant n his wonderful team for introducing us to this to this magical place. Seems like there’s so much more to discover in Sahyadri …thanks Hemant for putting this together.